I always sleep so well .. When my Mum first went into the Old Aged Home several years ago, my visits consisted of spending the entire day with her .. taking her to teas, coffees, lunches … more teas, coffees, lunches …. at many of the picturesque wine estates, gardens, beaches, tea\coffee rooms all in that area of the Cape. I used to go back to their house exhausted … chat until wee hours .. then fall into bed at night … and sleeeeeppp !!! I was always exhausted … mainly mentally !!! Now that my Mum can no longer go ‘out and about’ and my visits to her can only last a maximum of an hour at a time …. the rest of my time is spent … not lazing on my brother’s fine deck overlooking the entire False Bay … no … no … no !!!! I am kept very busy !!!! 🙂 I love it actually !!! I visited Mum while Kathy went to a ‘beading session’. As we had to share her car, I dropped her off at her friends home .. and what a beautiful home !!!! .. perched on the side of a mountain with views forever .. or so they said … could only see smoke that day, unfortunately, as there were devastating mountain fires in the Franschhoek region. Kathy’s friend, S, pulled out some boxes for me to peek inside … Christmas decorations which adorned her entire Christmas tree over the Festive Season … oh wow … they are amazing !!! Little teeny tiny angels, stars, and even little Christmas crackers ..
… snow flakes that twinkle held against the light …. can imagine them with all the Christmas lights on a tree …. twinkling and sparkling … !!! 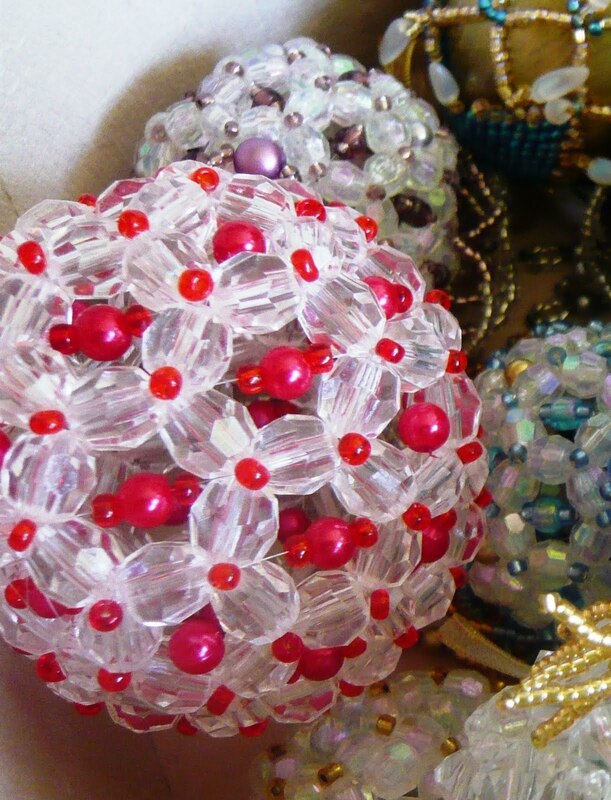 Christmas ballies … with air inside .. no filling .. just air … made entirely of shiny beads … and I might add … perfectly round !!!! .. different sizes of angels with pretty wings and skirts … one was all frilly … (it’s the way the beads are put together that makes the frills, I was told !!!) … absolutely fascinating !!! .. and look at this fine chap …. sparklingly perfectly round body and head !!! … keeping warm with scarf and fancy hat … love his ‘carrot’ nose !!!! There are even tassles at the end of his scarf!! Oh .. these are clever ladies indeed !!!! Thank you, S, for the tea and an insight into your amazing craft!! Now … off to make a cake for Connor’s birthday !!!! He has asked me to make a ‘Granny’s Speciality’ … !! Can’t believe he’s three already .. seems like the other day he was in NICU after his birth !!! What beautiful decorations! I do love Snowy, the Snowman .. and the angels! Power was eventually restored last night after it started and stopped and couple of times. Still no idea what happened. Tried to call City Power all day yesterday. The just don't answer their phones! Oh wow, these are just fantastic. My word, those are gorgeous!! Those beaded Christmas stuff are awesome. It must cost a bundle to stock up on them, but they will look unbelievable on the tree. What a fantastic blog Avril. It is such a pleasure having you here. S beaded Xmas decorations are fantastic. I am so happy you were able to share with us!!!! Wordless Wednesday : I am 3 ! !